...and here is the science! Although there is growing interest in mindfulness-based approaches for young people in schools 8,27 there are as yet few controlled trials, very few trials using a universal intervention and no trials of the MiSP curriculum. Results from this non-randomised controlled feasibility trial of the MiSP curriculum provide clear evidence of its acceptability, evidence of its impact on depressive symptoms and promising evidence of its efficacy in reducing stress and enhancing well-being. The MiSP curriculum's primary aim is to teach young people skills to work with mental states, everyday life and stressors so as to cultivate well-being and promote mental health. One of the strengths of the study was the choice of a follow-up period in the most stressful part of the school year to test whether the MiSP curriculum conferred protection as evidenced through less self-reported stress and greater well-being. Moderate evidence for effects in the adjusted analyses suggests that the programme may confer resilience at times of greatest stress. Moreover, in line with other studies our findings suggest that young people who engaged more with the mindfulness practices also reported better outcomes (e.g. Biegel et al, 28 Huppert & Johnson 29 ). Although the effects of the MiSP curriculum on depressive symptoms in the intervention arm are significantly greater than those found in the control group, the change scores suggest these would prove to be small effects in a larger-scale randomised study (See Table 3 for the confidence intervals around the change scores). However, moving the population mean even a small amount on key variables that confer resilience, through a universal intervention, at a key developmental stage could potentially have more impact on mental health than interventions targeting young people either at risk for mental health problems or young people who have already developed mental health problems. 9 Indeed, a recent pragmatic cluster randomised controlled trial (n = 5030) targeting young people at risk for depression compared a cognitive-behavioural intervention with an attention control intervention and usual school provision. 31 They found no benefit of the cognitive-behavioural arm over the other two arms; indeed, there was some suggestion of an exacerbation of depressive symptoms in the intervention arm that the authors attribute to increased awareness of problems. evidence of the enhancement of well-being including positive mood (Nyklíček & Kuijpers, 2008; Shapiro, Oman & Thoresen, 2008), self-esteem and optimism (Bowen et al., 2006) and selfcompassion and empathy (Shapiro, Schwartz, & Bonner, 1998; Shapiro, Astin, Bishop & Cordova, 2005; Shapiro, Brown, & Biegel, 2007). Mindfulness-based interventions have also shown substantial benefits for physical health, including the management of chronic pain (e.g. Grossman, Tiefenthaler-Gilmer, Raysz, & Kesper, 2007; Morone, Greco, & Weiner, 2008), improved neuroendocrine and immune functioning (Davidson et al., 2003; Tang et al., 2007) and improvements in health-related behaviours such as reductions in binge eating (Kristeller & Hallett, 1999) and substance misuse (Bowen et al., 2006). summarises the limited evidence published to date regarding children and adolescents. We focus here on the latter group, in whom mood is known to be volatile, and where there is evidence of low levels of satisfaction with school compared to younger children (nef, 2004). these measures appear to perform well in this adolescent sample. We further explored the baseline data by combining the baseline scores of the two groups, since there were no significant differences between them. This revealed some interesting associations between the psychological measures and personality variables, using the Big Five model of personality (McCrae & Costa, 1987). High levels of conscientiousness and emotional stability were associated with high baseline scores on all three psychological measures - mindfulness, resilience and well-being. In addition, high scores on extraversion and openness to experience were associated with high scores on resilience and well-being. High scores on agreeableness were associated only with resilience. would previously have impacted on their functioning and prevented them from sleeping. practices to be either ‘Slightly’ or ‘Moderately’ helpful for dealing with their emotions. ...Further analysis of the qualitative data also revealed that a number of pupils perceived that their use of mindfulness techniques had help them to regulate their behaviour more positively, particularly during interpersonal disputes. For these individuals such changes were attributed in part to an enhanced perception of their own mental states. ...A further perceived impact of studying mindfulness noted by pupils was that of improved interpersonal relationships. A number of pupils, particularly from school B (state educated), described how their application of mindfulness techniques had helped to calm them down during disputes with family members and to enable them to be more empathetic and considerate towards the other person(s) involved. of questionnaire data found that the perceptions of pupils from school B in relation to such impact were found to be statistically more favourable than those reported from pupils’ from school A (Privately educated). In addition, ratings were also higher from pupils completing the ‘. b’ course in the Spring term rather than Summer term. - what is the mind? - Challenge – can you keep your mind in one place? - slap, clap, snap, snap. - how have you improved? - spot the squirrel discussion: where did your mines go last week? Discussion time – difficulty and helpful? Game – the watcher and thoughts, feelings, impulses, sensations, it sounds. 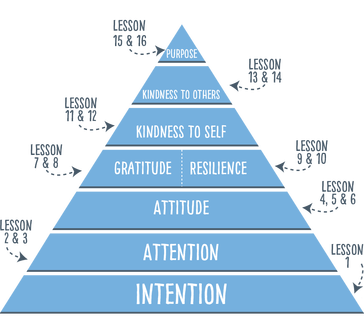 Why is kindness important to grow? - where is the mind? - traffic in the mind right now?